Breakfast time with three kids can get pretty hectic, especially on a school day. I try to do as much as I can in advance so our mornings can run as smoothly as possible, but we still run into problems. Because my kids love having pancakes and french toast for breakfast, once or twice a month I'll set aside an hour or so and make up several batches of each, then put them in the freezer. Great idea, don't you think? So what's the problem? It's the syrup! Inevitably, there's whining (them) or hollering (me) and it's all about the syrup. If I put it on for them, they start whining that there wasn't enough, someone else got more, or I incorrectly put it on top of their pancake when they wanted it next to it. If I let them put it on themselves and turn my back for a second to pour some orange juice, I turn around to find their french toast pieces swimming in a syrup soup. 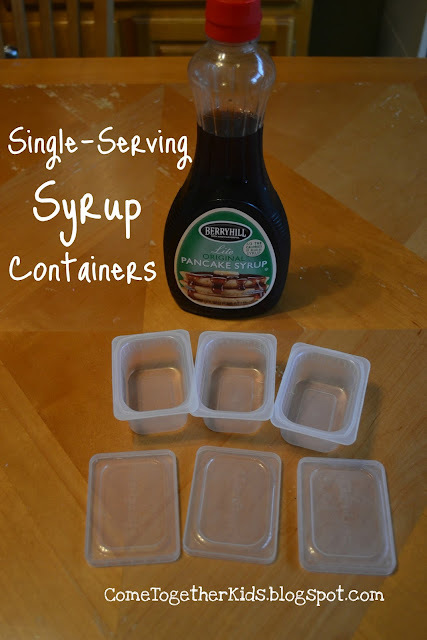 I thought it was just going to be one of those little problems I'd just have to deal with, until I came up with a simple solution ~ single serve syrup portions that they could pour out themselves. A friend from my mom's club (hey, Anna!) was getting rid of a bunch of the plastic baby food containers and I immediately recognized their potential to solve my syrup woes. Next, put the lids on and pop them in the fridge so they're ready for breakfast. The kids love being able to pour out as much as they want from their own containers and I love not having to watch over them. My oldest can even get the pancakes out of the freezer herself and pop them in the microwave for everyone. (Definitely a plus when I'm trying to get last-minute things in their backpacks and get myself ready for the day.) It hasn't solved all our morning issues, but it's one less thing I have to worry about. You are a GENIUS!!! Man, I bet that helps so much! I need to get my hands on some of those containers! Wonderful idea! I saved all the gerber containers and jars from my son. I have BOXES full. For Halloween I plan on using the plastic containers as little treat boxes for my daughters class! And the jars I gave some to my mother in law who plans on using them for candles. I would have never thought to use them for syrup! Thanks for the tip! Brilliant, Laura. I'm glad you found a useful way to use those containers! Genius! I love it. Especially to use for dips in their lunches too. Thank you! Love that idea! I also had problems finding a small enough container for salad dressing. While at walmart, I spotted some little containers. 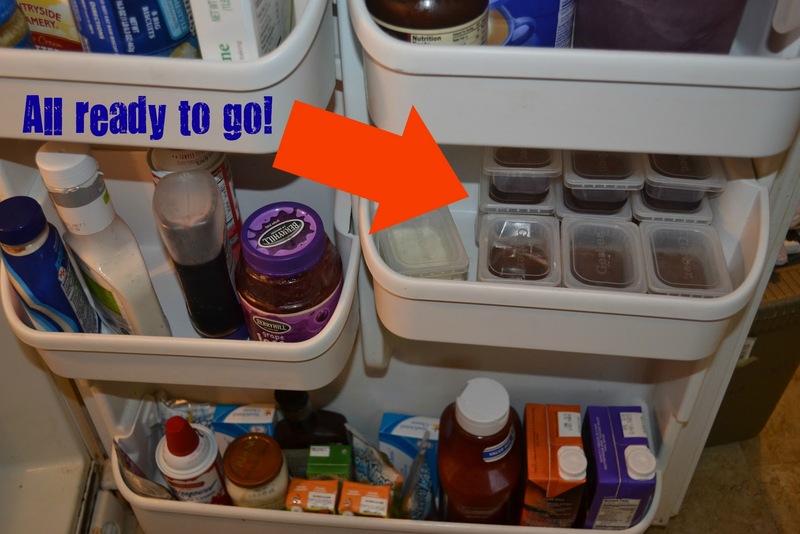 They work very well and I have reused them a few times before the lids crack. Oooh, that's wonderful!! Love it! What about real maple syrup in a glass bottle? It contains healthy sweetness and minerals and nothing harmful. Conveniences and fake foods are killing us. Just cause you're not bleeding doesn't mean it ain't so. Please don't believe me. Educate yourself. Now that's thinking. Like they say neccesity is the mother of invention. You certainly proved that to be true. Shannon, they're fairly secure. Every once in awhile one will leak, but that's mostly if the kids are swinging their lunchboxes, sitting on them, etc. What a great idea! My kids fight about the syrup too and if I let them do it themselves then the bottle is empty in a week! I love these containers too! I kept the ones we bought when my first son was born for years after the baby food was gone. I never thought of them for syrup, but I made individual jellos in them and the kids loved them. My kids use way way too much syrup. I like this idea! I Really Like this Idea. I will definitely try it. I never thought of them for syrup, but I made individual jellos in them and the kids loved them.